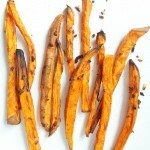 Beer-Marinated Baked Sweet Potato Fries | Yup, It's Vegan! These baked sweet potato fries will surprise you with their crispiness and subtle beer flavor, all while being made with only a little drizzle of oil. I usually add minced garlic to these because I love the bits of garlic that get really toasted – even a little burned – in the oven. And if we have a quarter of an onion in the fridge, I’ll mince that up and add it, too. But you can also keep it simple with just beer, salt, and sweet potatoes. Or regular potatoes! I’ve pretty much always used whatever beer we happen to already have. I would say that extremely dark beers might not taste as good, but otherwise, I don’t think it matters a whole lot. My understanding is that gluten-free beers will also work! If applicable to you, you’ll want to check Barnivore for a beer that is produced without the use of animal byproducts. The one thing that you really DO need to do in order to get the best results from these, is to lay them out in a single layer on your baking sheet. 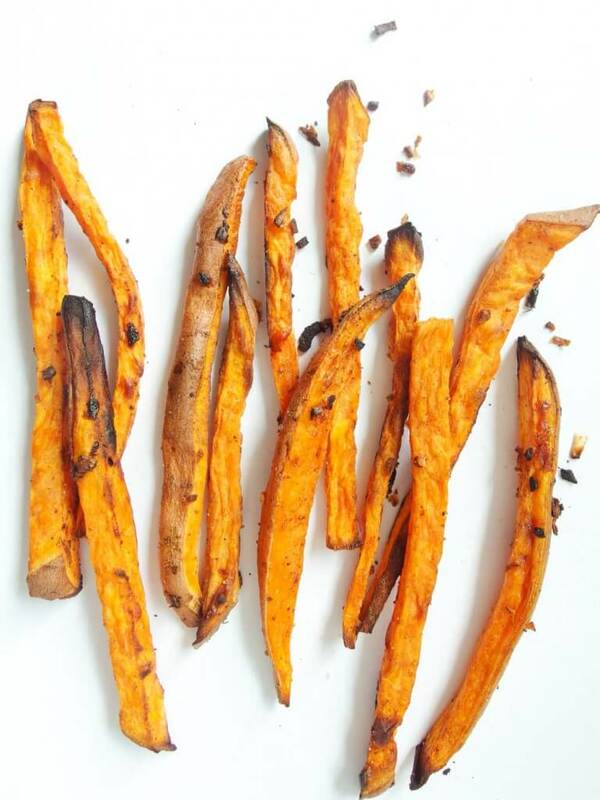 I know it’s a pain because it stops you from making a million baked sweet potato fries at a time (if you’re anything like me, you’ll wish you had a million), but they just won’t get crispy if the baking sheet is crowded. If you like soft, limp fries then go for it (hey, some people do, I won’t judge). Generally I can get two medium-sized sweet potatoes’ worth of fries onto my two bigger baking sheets. I hope that those of you with a long weekend are enjoying it to its fullest potential and experiencing some nice spring weather! Until next time! Delicious baked sweet potato fries that are marinated in beer for a delicious flavor perfect for game day. Tossed with garlic and onion. Toss together the cut sweet potatoes, garlic, and onion in a wide bowl, or baking dish. Pour enough beer over the potatoes to cover them. Let marinate for 30 minutes, stirring a couple of times. Preheat the oven to 425 degrees Fahrenheit. Prepare two baking sheets lined with parchment paper or Silpat-style liners. Drain out the beer, and toss the potatoes with a small drizzle of oil, just enough to lightly coat. (I used about 1 tablespoon). Spread out the fries in a single layer on the baking sheets. Leave as much space between them as possible and utilize the full 2 baking sheets. Sprinkle salt and pepper over the top. Bake for 25 minutes. Remove from the oven, and stir in the garlic and onion while flipping and agitating the fries. Return to the oven for about 20 more minutes, or until browned and crispy. Serve immediately. For another delicious twist, toss the fries with Old Bay seasoning before serving. Recipe adapted from Edible Perspective and the Taste Space. Shared on Healthy Vegan Fridays. 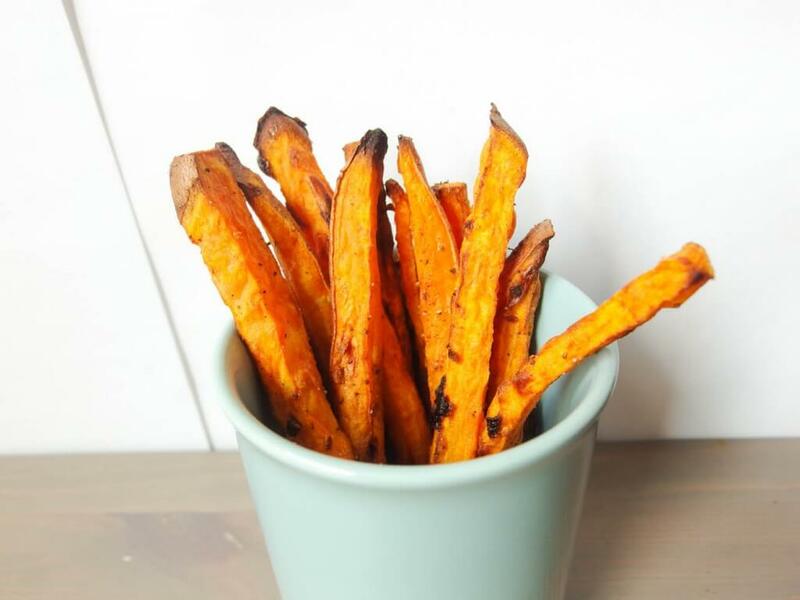 I tried this after seeing a recipe for beer potato fries and looking for a sweet potato version. They weren’t as super-crispy as a regular potato version but we still liked them a lot! Oh my goodness this is an awesome idea! I would never think to try this. SO doing this soon. Thanks, Trish, you’re definitely going to love it! Fun idea! We make a batch of baked sweet potato fries & regular fries at least once a week, but I’d never thought about marinating them in beer first. I’ll have to try that! Thanks for the tip! Thanks, Cadry! I was a bit scared the first time I made these that they would come out soggy, but quite the opposite! You’ll have to let me know if you give it a try. 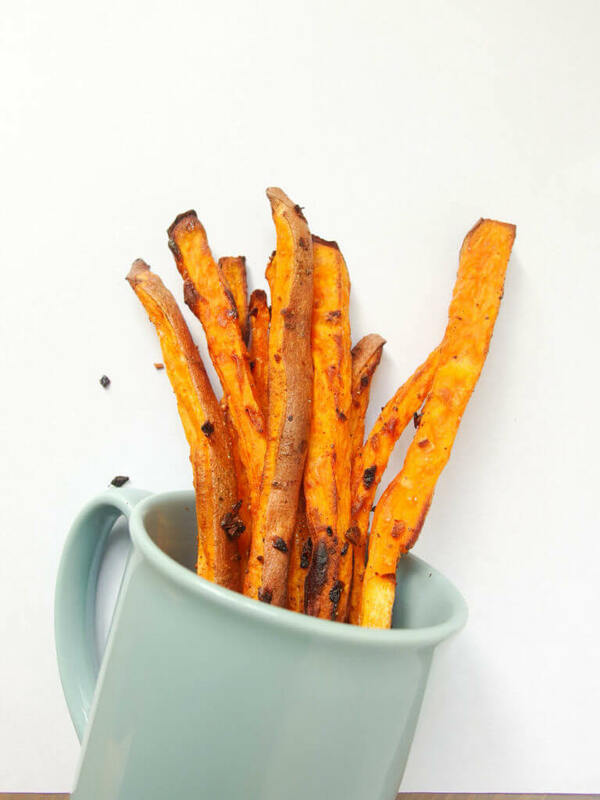 Yeah, our late-night snacks rarely make it to the blog.. 🙂 and thank you for sharing the sweet potato spin on it, I think they’re better than regular potatoes in this!